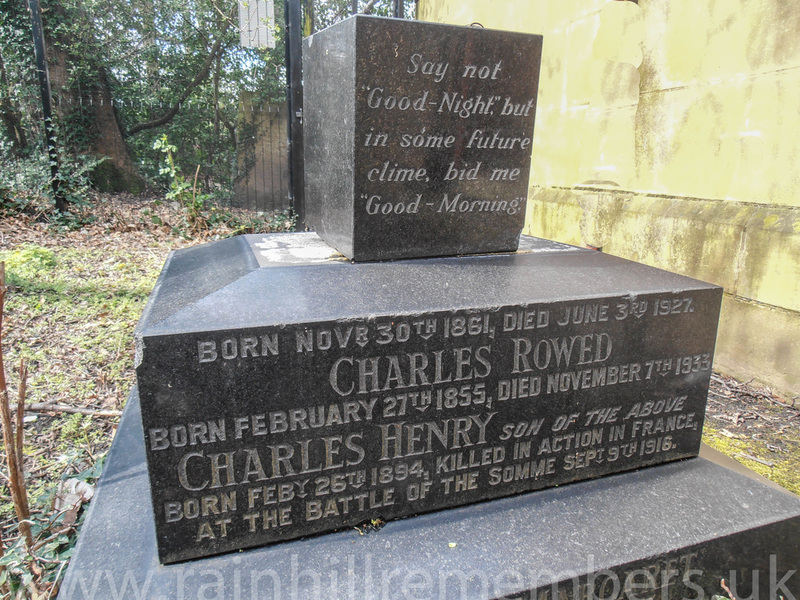 ​Charles Henry Rowed was born in 1894, son of Charles and Christina Davidson Rowed. In 1901 he was living in Eccleston Park with his parents and two older sisters. He was educated at Liverpool College and by the time he was 17, he was working as a clerk in Parr’s Bank in Prescot. In January 1915, Charles enlisted with the South Lancashire Regiment as a 2nd Lieutenant and four months later he was promoted to 1st Lieutenant. In July 1915 he went to the front. He fought in the Battle of the Somme. 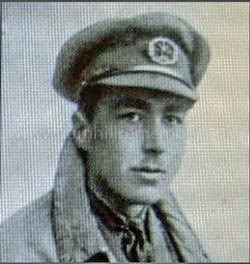 Charles Rowed was shot by a sniper whilst in a trench dug the night before 300 yards in advance of the Front Line. 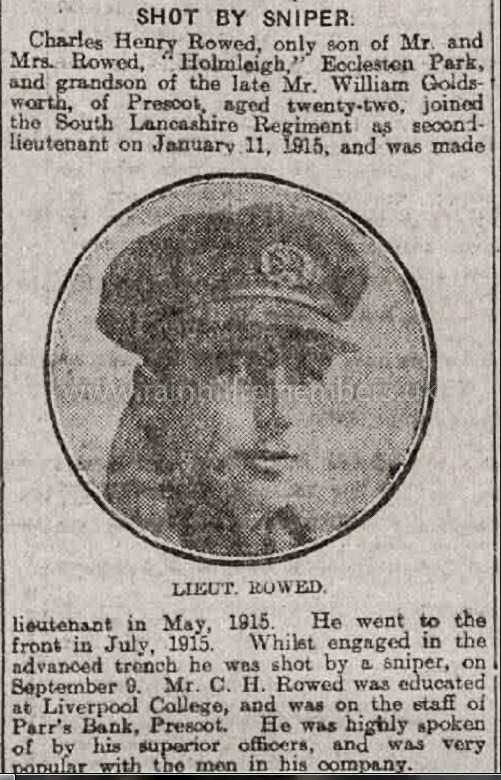 He died on 9th September 1916. Charles is remembered on the family gravestone (above) in St. Ann's churchyard. He is also commemorated on a memorial at Liverpool College and on a brass plaque in St Mary’s Church, Prescot. At a special ceremony at the Warrington Road Cenotaph on Sunday 3rd July 2016, Rainhill village dedicated a new plaque bearing the names of 17 men with Rainhill connections who perished during WW1. These men's histories were found during Rainhill Civic Society's research. Rainhill Parish Council funded the plaque and organised the ceremony with Rainhill Civic Society, our local Churches and the Royal British Legion. Charles Henry Rowed is one of those names. 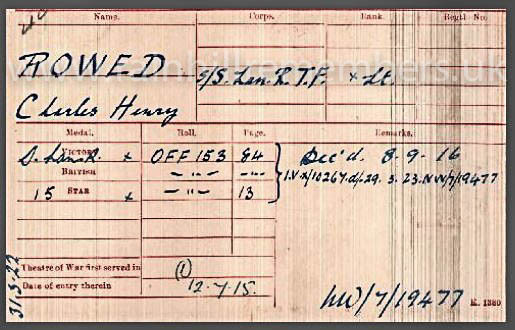 The medal card below of Charles Henry Rowed shows that he was entitled to The Star, The British War Medal and the Victory Medal. (Note that the card shows Charles deceased on 8th Sept 1916, but the gravestone above shows 9th Sept). Charles’s sister, Christina Margaret Rowed became a VAD nurse and worked at Oakdene/Oaklands Hospital between 1917 and 1919. She died in March 1930.